The book presents the taxonomy and systematics of bees (Anthophila) and their biology: the collection and transport of food, picky behavior of bees, which are linked to certain food plants, nesting methods, Cuckoo bees laying eggs in the nests of other species, behaviors and adaptations of males. 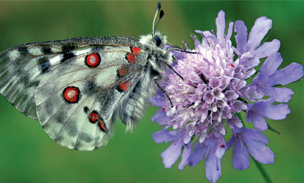 In the chapter on the diversity of wild bees changes in the Slovenian fauna are described. In the author's opinion, they are mainly due to climate change and extreme weather conditions. The greater part of the book deals with the social life of bees, especially the primeval social forms that facilitate the understanding of the development of social communities. In the chapter Highways and byways of evolution author describes the long-term advantage of species with social or symbiotic connections over the species in which the dominance of the strongest and largest specimens in mutual combat increases the size of the specimens and reduces their number. He continues with a chapter on the various forms of social communities, with examples in bees. In the last chapter the families and genera of bees living in Slovenia are presented. Great value of the book are also 154 original photos of different species of bees, which illustrate their behavior in the wild. Bees are as pollinators of many plants indispensable to the survival of terrestrial biological communities. Man has valued honeybees, which are kept for the production of honey, wax and other goods of the beehive, for long. Increasingly he also recognizes the important role of bees in the pollination of plants, which is necessary for good fertility. But only a few people in addition to domestic bees know the multitude of mostly solitary wild bee species that cannot give us honey and wax, but play an important role in pollination. Some solitary bees and bumble bees that are more successful in the pollination of certain crops, such as tomatoes and alfalfa, are bred in some places. But most bee species are increasingly threatened due to human activities. The author has studied the social behavior of the species Halictus scabiosae and observed the formation of new communities of individuals who come from different nests in the same nesting ground. This observation is just one of the reasons why the author rejects once the prevailing theory on the evolution of social communities due to the narrow genetic relatedness among members of the community. Separately he presents an endemic species, spread in the karst edge from Italy through Slovenia to Croatia. The development of infertile workers that help communities, but do not reproduce themselves, is seen as development of a superorganism which is entirely determined by the genes of reproductive individuals. Infertile workers are just one of the features that enables queens to reproduce successfully. Superorganisms, developed in insects and some other animals, are compared with the body of a multicellular organism, which is a community of cells in which only gametes reproduce.